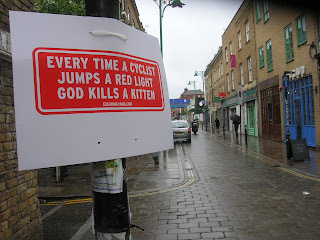 Good old Karmarama launched yet another campaign a couple of weeks ago urging those naughty cyclists to stop at red lights rather than going right through the bloody things like they're not even there! 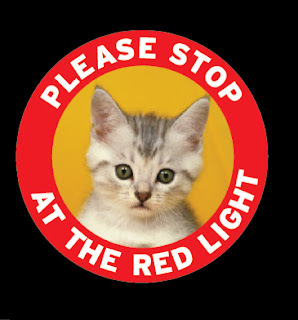 Just think, cute little kittens getting all killed by the Great Almighty every time one of these selfish doughnuts ignores a perfectly good road sign. Signs were posted on all major thoroughfares throughout London, until the boys in blue pulled them down to restore a bit of law and order. We remain undeterred though. Just remember, next time you see a cyclist jump a light, rain down a bit of friendly karma on his arse, with our best wishes.